Random And Some: "God bless all we leave behind us, and send us safely back"
"God bless all we leave behind us, and send us safely back"
I just finished reading The Lost World (1912) by Sir Arthur Conan Doyle aka the father of Sherlock Holmes and the crime fiction genre. In The Cult of 'Jurassic Park', in which Grantland writer Bryan Curtis studies the Jurassic Park subculture, it is stated that JP is basically a reboot of Doyle's book, which, of course, immediately sparked my curiosity. Fuelled by the release of Jurassic World in June, the child in me is trying to piece together the franchise puzzle, and I figured that The Lost World was a proper place to start. When Professor G.E. Challenger returns from Latin America with an unbelievable story about the discovery of dinosaurs, Daily Gazette reporter Edward Malone is tasked with interviewing him to determine wheter his claim is truthful. Along with skeptic Professor Summerlee and dead-shot Lord John, Edward is invited by Challenger on a trip to prove his story. At long last they arrive at the remote Amazonian plateau. Unfortunately, when their bridge is destroyed, the four men end up trapped. Beside investigating the lost world and having adventures, the foursome must now also find a way out. I was curious as to in what degree Crichton copied Doyle's dinosaur adventure but, all in all, Jurassic Park is far from a carbon copy of The Lost World. Sure, both are about dinosaurs hiding in Latin America, with scientists sent to discover them, and I guess to some extent the observational nature of their writing is similar, but the plots are nothing alike. 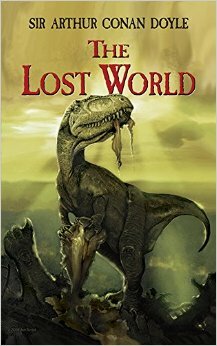 If you are a dino fan or a Jurassic Park fanboy trying to decide if you should read Doyle's The Lost World: be warned that there are actually very few dinosaurs in the book. Sure, TLW is a an engaging book filled with lively characters and tons of adventure, but it was a bit short on dinosaur action for my taste. "Whatever happens, don't wait for me!" Is the Indominus Rex still alive? "This spot and this family are mine"